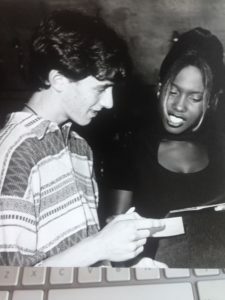 In this episode I got to meet up with 90s RnB pop goddess Michelle Gayle… for the second time! As you can see from the photo below myself and Michelle Gayle are old friends. I won a competition to meet her back in the mid-ninties and because I was under eighteen I had to bring my Dad. Michelle was a struggling singer who became an actress and then a very successful singer. She appeared in Eastenders and in the space of three years released two albums and a string of top 20 pop bangers like “Freedom”, “Looking Up”, “Do You Know”, “I’ll Find You”, “Happy Just To Be With You” and of course “Sweetness”. She was nominated for three Brit awards and then mid-way through promoting her second record which started off more successful than the first, she disappeared. There were rumours of her changing record labels. But fans never knew what happened until now. She went on to star in Beauty and The Beast on the Westend becoming the first black woman to play a disney princess in the UK. After that she took part in the reality series “Reborn In The USA” where she competed with fellow ex-popstars in the US for a new record contract. The series ended up being a lot more then what they had signed up to and despite the very bizarre circumstances Michelle ended up in the final. Most recently Michelle starred in the fantasy series “Wolfblood”. She has written three novels and is currently touring in “Son Of A Preacher Man”. She will be performing in the Bord Gais Energy Theatre with the show from 22nd to 26th May.